It's time for Budgeting Bloggers! I kicked off the month with a big bundle of Poshmark sales (and still more items available), so my budget got an early boost. Woohoo! There were definitely a few pieces I wanted to invest in this month for my wardrobe, and every little bit helps. I also received a nice cash gift, so I gave myself a HUGE budget of $250 for the month. BOOM! It was burning a whole in my pocket. J. Crew Factory Clare Cardigan in Golden Mustard (originally $50, paid $25): I was waiting for a mustard cardigan to come around that I liked, and J. Crew Factory brought theirs back! Timed with a 50% off sale, I snagged this for just under $25. Shipping and tax added about $10 to the total bill for this and the next shirt, so for #4 & #5 I billed my budget $70 total. I have this cardigan in tomato red and black, and they are super comfortable. Probably the only cardigan I will ever buy from now on. J. Crew Factory Peter Pan Collar Tee (originally $68, paid $34): Pricey impulse buy, but it looked so cute with the collar and cuff accents! I have been buying so many bottoms it felt right to invest in a new top for work. I liked the version with the printed tiny dots, but it was sold out. I ordered it hoping the quality would be good, and therefore worth keeping. 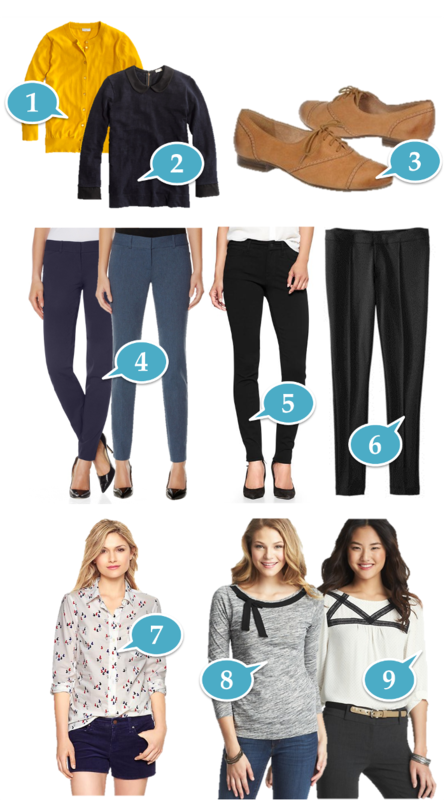 Limited Exact Stretch Skinny Pants (originally $70 each, paid ~$48 each w/shipping+tax): Had $25 virtual dollars, plus a B1G1 50% sale happening, so I ordered my favorite trousers in indigo blue and navy. Decent savings (though the sales are never as good when you have rewards) and I already know these pants are a staple for me at work. On my wishlist too! Gap Ponte Legging Jeans (originally $70, paid $57 with discount code): These are offered online-only at Gap, and the reviews were fantastic. I love wearing leggings when I travel, so I figured these comfy leggings that are more like pants would be a worthy investment. But I did forget to order these in ankle length, so now I have to hem them! Merona Ankle Ponte Pant ($25): I love the Gap Legging jeans for a work (and travel) appropriate pant. But when I saw these in-store at Target, I decided to pick up a black pair to wear on the weekends now that it's getting chillier. These will replace my worn-out Walmart leggings, and look less lazy at the same time. Gap Boyfriend Shirt with Cat Print (originally $55, paid $35): I have another boyfriend shirt from Gap that I wear to work quite a bit... also with a different cat print. This one I knew I'd need a cami with, but I wanted it nonetheless... again, working in pet food this is another great buy for me that can coordinate with a number of outfits! LOFT Bow Neck Cotton Tee (originally $40, paid $18): 50% off sale at LOFT online! I felt a little like I'd spent all fall investing in pants, and not enough in good tops for work. These fit the bill. Same as above. LOFT Pin Dot Print Lace Trim Blouse (originally $60, paid $28): Same as above, and I absolutely love it! This month, I think I did a good job of getting almost everything on my wishlist plus a lot more! I planned my purchases out, leveraging sales and promo codes as much as possible. I'm loving the pieces I buy more and more, vs. just liking them and staying on trend. Also, spending my entire budget too early in the month makes me really cranky and sad later on, so I'm going to try to do a better job of spacing out my purchases for that shopper high. Here's an early-morning pic of me in one of the Exact Stretch pants from Limited... almost literally my new uniform for work! Black, Maroon, Indigo, and Navy. I know, I buy things in pairs. But I won't need any more pants for ages now. Except MORE PONTE PANTS OMG. Those are my new sweatpants. A vest for layering... I'm seeing them everywhere! I don't do puffy, so something like these quilted Old Navy ones might work. More Gap Ponte Leggings!!! MORE!!! Timberland Savin Hill Riding Boots are now on my Christmas list. At $220 they are clearly over my monthly budget, but I'm holding out to ask my family to pitch in for these! I was tempted to use my gift money to buy them, but I have other boots so they aren't a pressing item right now. Just on my radar. Check out more of this month's budgeting bloggers at Fran's link-up! Y'all and those pants! lol. Fran is obsessed with them. Similar to me and my cafe capris. I may just have to go give them a shot. And you can never have enough cat print. I work in a business casual environment, but the only pants I owned were jeans. So when I found the Limited pants in-store, I bought two pairs, then saw that Fran has them too! I love that she has them because it helps me figure out how to style mine. They are seriously comfy, easy to care for (wash, hang dry, iron), and they make me look more put together than jeans. And you can NEVER have enough cat print, you're right! I think this is such a great idea! Sadly, I feel like selling clothing online is so much work.I've never had that much luck with it.....that or nobody wants my stuff:) Maybe once the Holidays have passed, I can get this organized! I am at the point where I don't have much to sell anymore, and sometimes it's just easier to make a donation! It's worth it if you have a lot of good brand-name items to sell, and you make a big push like I did. But I wouldn't be surprised if you don't see me making many sales past the end of the year, because I've gotten my closet to the point where I don't want to be rid of anything anymore. I may continue to use Poshmark if I have some brand-name handbags I tired of, but even now I feel pretty good about where my collection is currently. If you end up doing Poshmark, don't forget to check out my post full of tips! Target, of all places, has a really cute moto jacket this season. Its faux and thus cheap and I have contemplating buying it everytime I shop! I will check it out! I found a Members Only one at Urban Outfitters I want to try too. those pants look so good on you! i could use some nice tops and a solid winter coat but i've had my eye on these gorgeous floral boots and can't stop thinking about them. . . i'm also trying to pare down everything i own so i have less decisions to make when getting ready so every time i fall in love with an item i've really been questioning if it's necessary. . . ahhh! clothes! stopit! Thank you!!! I love that I can step up my game at work beyond jeans. :) You know, the holidays are coming up, so putting some of those items on a wishlist might mean you get some as gifts! I'm putting nice work tops in as a request from my Mom and sister. Send me a link to those boots! I know what it's like to want keep thinking about something like that... I thought about my Toms wedge booties for a year before taking the plunge, and now I wish I'd done it earlier. You got some great items for under $250! I love those oxfords! I have a pair of naturalizer boots and they are so darn comfortable! I have been thinking about getting more shoes from them - I need to look at what they offer. Anyway, you did such a great job!